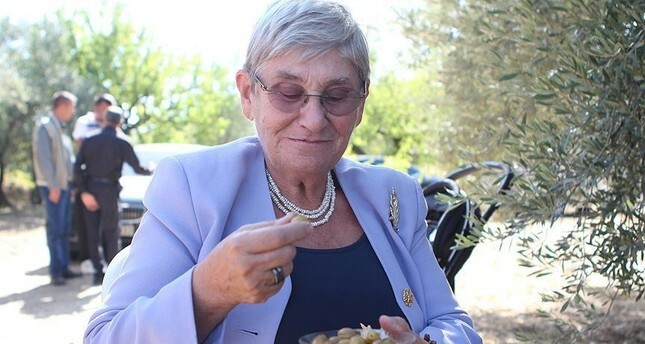 Prof. Dr. Canan Efendigil Karatay also promotes olive consumption. While it may easily be assumed that the Turks are a healthy bunch, given their Mediterranean diet and active lifestyles, Turkey actually has a serious obesity problem with nearly 30 percent of the population overweight, the highest figure among European countries. While the government has implemented a number of inspirational programs to get people moving more and eating better, the airwaves also devote a significant amount of time to discussing ways to eat better and live healthier and a number of healthy living and nutrition professionals have become the most read and most written about public figures. There are two in particularly well-loved and respected specialists in eating and living healthy that through their books have been inspiring and teaching people how to implement simple changes to see big changes in their health. If you have not heard of these Turkish diet divas yet, it is high time you do because their advice and suggestions may very well set the stage for serious life and health improvements. Canan Efendigil Karatay has fast become a household name with her diet that focuses on eating healthy with an emphasis on low glycemic foods and consuming high protein. Born in 1943 in Elazığ, Karatay studied internal medicine at Istanbul University and then went on to receive her specialist training in cardiology at the Liverpool Regional Cardiac Center. A well-respected doctor in her field, Karatay has created a diet that has for many become the guidelines to reclaiming their health. With six books to her name and over 1 million editions in print, Karatay and her aptly named "Karatay Diet" have become household names in Turkey. Karatay's diet proposes a number of controversial tips such as eating all types of protein regardless of calories and consuming healthy fats. She believes breakfast is indispensable, snacking superfluous and that we should only have two and at most three meals a day. She argues that Turks eat way too many carbohydrates and that cholesterol is not as bad for the body as it is assumed. Karatay's break out first book, aptly entitled, "Karatay Diyeti" (The Karatay Diet) was released in the spring of 2011 and was a best-seller and has remained one of the most popular books for healthy living in Turkey. It boasts "the ABC's" of losing weight based on scientific facts. "Karatay Diyetiyle Yaşam Boyu Sağlık" (Lifelong Health with the Karatay Diet) was her second book released in the fall of 2011, and carries the motto, "Goodbye to being overweight, hello to happiness." This book is a continuation of Karatay's diet plan, which, according to the cover has a near 100 percent success rate. Her third book, titled "Karatay Mutfağı" (Karatay's Kitchen) and released in 2012, is a cookbook on how to prepare the low glycemic and healthy meals and ingredients she recommends. In it she provides instructions on healthy cooking methods and on how to prepare homemade items such as butter and yogurt, which she so wholeheartedly recommends in a healthy diet. In 2013, Karatay's book, "Karatay Diyetiyle Obezite ve Diyabete Çözüm Var!" (There are Solutions to Obesity and Diabetes with the Karatay Diet), shared pertinent tips on how to tackle obesity and diabetes through adopting a healthy lifestyle. The book's motto: "The 20 simple steps that will save your life." "Karatay Diyetiyle Beslenme Tuzaklarından Kurtuluş Rehberi" (The Guidebook to Escaping the Traps of Nutrition with the Karatay Diet) is Karatay's fifth book, which goes into further detail into the causes of hormonal imbalances and metabolic disorders by explaining how healthy proteins, fats and carbohydrates should be consumed and their positive effects for optimal health. Karatay's latest book, released in 2016 is titled "Canan Karatay'la Şifa Bulanlar" (Those who Reclaimed their Health with Canan Karatay) and is a compilation of 50 success stories of people from a variety of age groups who have successfully adopted healthier lifestyles resulting not only in weight loss, but with many giving up their meds and even eradicating illnesses. Ayşegül Çoruhlu is Turkey's aficionado on the Alkaline Diet. A biochemistry and anti-aging specialist, Çoruhlu's "Alkali Diyet" as it is referred to in Turkish and doubles as the name of her bestselling book, has contributed significantly to the trend of maintaining the optimal alkaline and acidic balance, otherwise known as PH levels. Born in 1969, Çoruhlu graduated from the Istanbul University School of Medicine. She then went on to specialize in biochemistry at Şişli Etfal Hospitaal and then attended the master program of Biomedical Engineering at Boğaziçi University. She went on to become a biochemistry specialist at Amerikan Hospital and was also the lab chief at Interned Policlinic, where she devised a check-up program for preventative medicine. This included anti-oxidant, food sensitivity, hormone and genetic tests, which made her one of the first to implement this type of anti-aging approach, which she went on to coach pharmacists and doctors on in seminars. She has since been sharing her wisdom in her two bestselling books, "Alkali Diyet" and "Tokuz Ama Açız," which explains the biochemistry of dieting from a cellular level. Çoruhlu's alkali diet is based on the theory that the human body is programmed to be slightly alkaline and that excessive acidity is the cause of a wide variety of ailments ranging from cancer, cholesterol, osteoporosis, obesity, and more. The solution is simple: eat more alkali and less acidic foods and Çoruhlu's books explain in detail just how to do it. "Alkali Diyeti" was released in 2012 and was revolutionary in making the terms "alkaline" and "acidic" regularly fall off of everyone's tongues. In her book, she explains why maintaining an ideal PH balance is important, how excessive acidity can lead to serious ailments and how to implement easy changes to bring more alkaline foods into our diets. Çoruhlu's second book, "Tokuz Ama Açız" (We are Full, but we are Hungry), was released in 2013 and goes even further into detail on how to implement and alkaline heavy diet for long-lasting weight loss and health benefits.